Validamycin and Its Derivatives: Discovery, Chemical Synthesis and Biological Activity presents, for the first time, a complete review of the underlying chemistry, synthesis, behavior and application of these compounds. 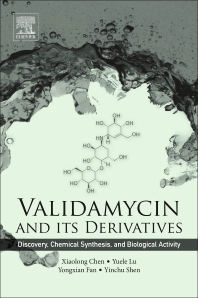 Beginning with an introduction to validamycin, the book then outlines the key elements of its discovery and production, including details of its structures, isolation, analysis, and issues relating to its large scale production. Biological activities are then explored in more detail, followed by details of biosynthesis. Further to this, the chemical synthesis of validamycin and its intermediates, including valienamine, validamine, valiolamine, and validoxylamines is reviewed, before preparation of these derivatives and their biological activities are explored. Finally, the book concludes with a discussion of the economic aspects of working with validamycin and its potential in future applications and trends. With its detailed chemical coverage from a team of expert authors, this detailed guide can be applied to the large-scale industrial production of antibiotics and the adaptation of bioactive agents, from agricultural, to novel pharmaceutical applications. Professor Chen and his team have decades of experience working with Validamycin. Their research originally spanned its initial discovery, development and production as an agricultural antibiotic, and is now focussed on exploring its recent adaptation to a pharmaceutical lead with a multitude of potential applications. The group have published numerous papers on their work, including an important review on the preparation of Validamycin derivative Valienamine in 2003, followed by another key review on the preparation of Voglibose in 2006. In addition, they hold a number of patents relating to the degradation of Validamycin to produce Valienamine.